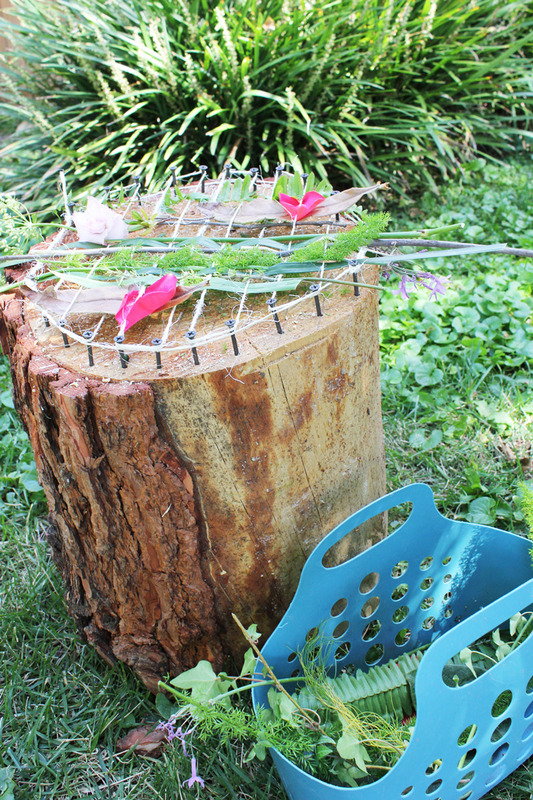 Today we are making an outdoor loom out of a tree stump…I’m dubbing it our Natural Loom! I love good old fashioned projects and weaving is my latest crafting obsession. And a loom doesn’t have to be complicated; it can be as simple as a piece of paper with cuts down the center, or a string woven through holes in a shoebox. 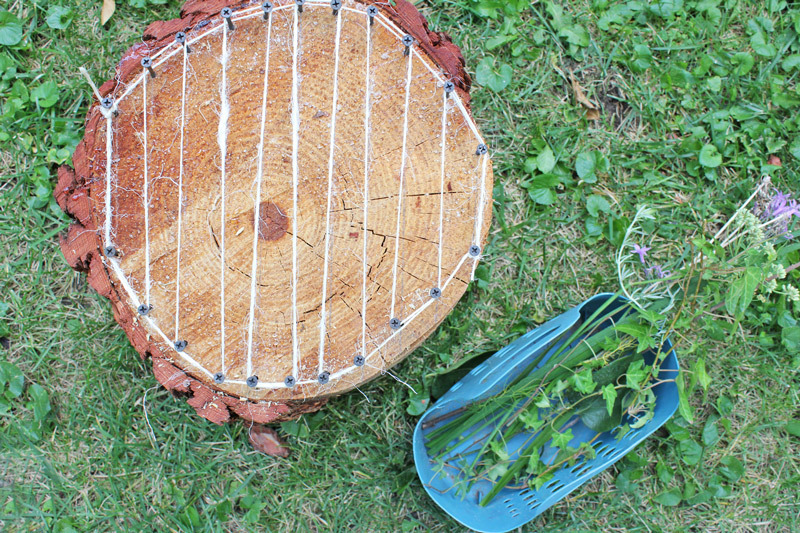 After our paper-weaving project last month I got a little excited about loom crafts and weaving for kids and decided to try making a Natural Loom that could be used outside and woven with natural materials. 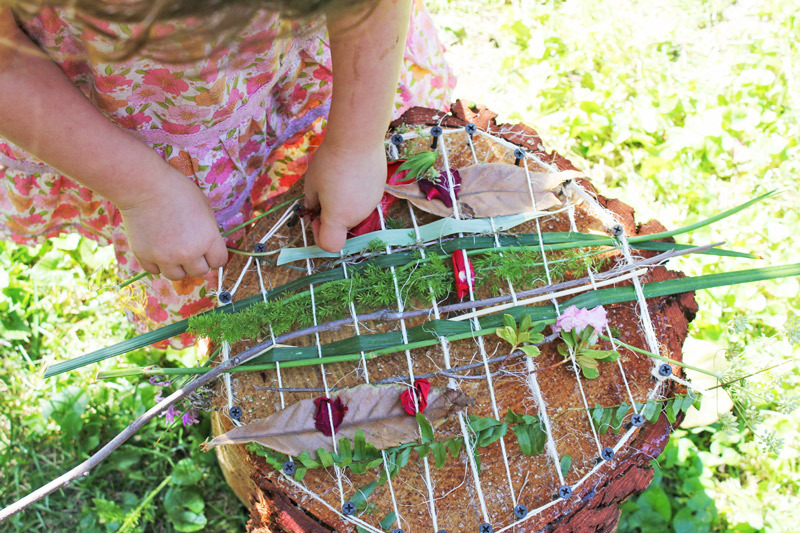 I was recently captivated by these simple Nature Weaving Looms and how pretty they looked and got to thinking about how to make a more permanent loom feature in our yard for the kiddos to happen upon. I’ve also be looking for tree stump ideas with our growing collection of tree stumps (I just can’t help but stop the car and asking for a few whenever I see a tree being removed in my neighborhood). Wouldn’t these be really wonderful in an outdoor school or at stopping points on a nature hike? This tutorial will show you how to make the loom and is an adult project. But USING the loom is all about the kiddos. 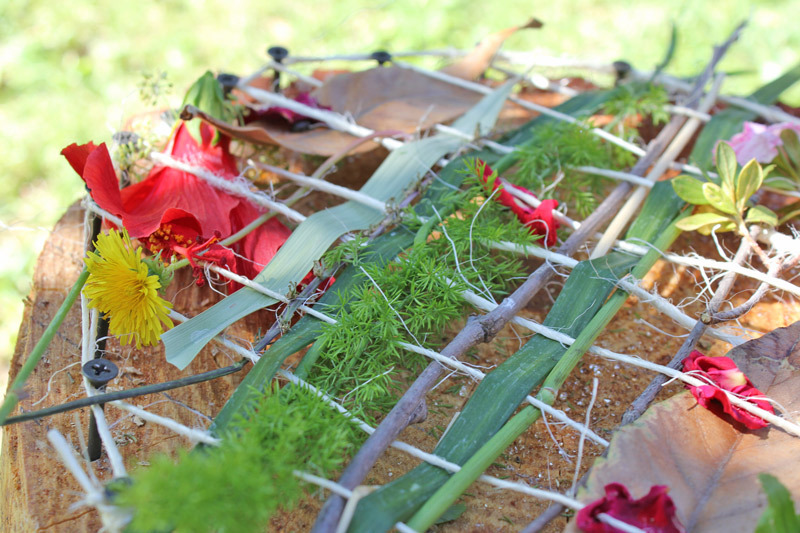 Once it’s done, leave it out with basket of leaves and flowers nearby as a wonderful invitation to play. Step One Starting about 1” in from one end of the stump draw vertical lines at roughly 1” intervals across the face of the stump. Step Two Mark the holes for the screws at the top and bottom of each vertical line. Stay about ½” to 3/4” in from the inner edge of the bark so they have plenty of wood to sink into. Step Three Using a drill bit with a diameter that is a slightly smaller than your screw diameter drill pilot holes at each mark. Step Four Now drill in your screws. 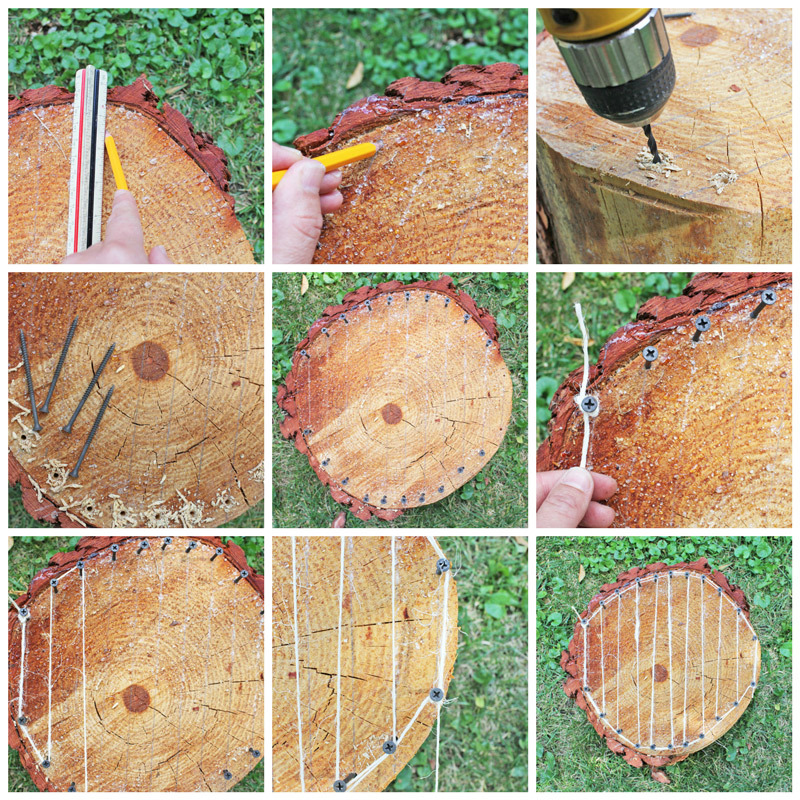 I used screws where the threaded section stops about 1” from the top so I could easily tell how far to drill them into the stump. You’ll want to leave about 1” from the face of the stump to the top of the screw. Step Five Tie the loose end of the twine around the outermost, top screw and knot tightly. Now string the twine down to the screw directly below it then over to the screw directly to the side of it. Continue threading the twine in this pattern around all the screws. Step Six When you get to the end you can wrap the twine around all the outer screws then trim the twine and knot it around the outermost, lowest screw on the opposite side of the stump from where you started. 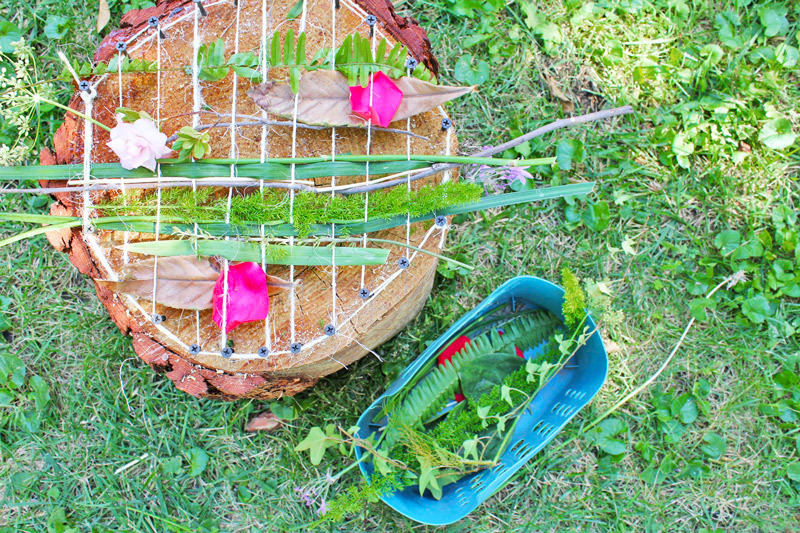 Now it’s time to collect natural materials to string through the loom. This is the perfect time to hand your child a basket and go on a materials hunt around your yard or neighborhood. 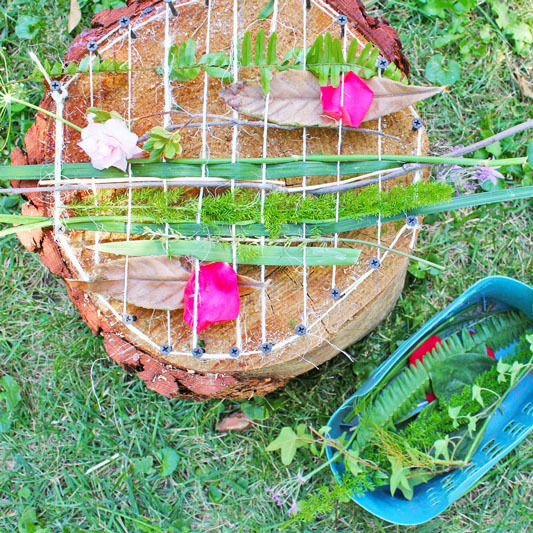 Longer leaves, sticks, and petals are perfect for weaving but allow your child to select their own materials and they will quickly get a sense of what is easier to weave and what is not. Branches with spiky leaves are much more difficult to string through the loom. Claudy Longstra. Talk about unusual weaving techniques and results! I fell in love with Claudy Longstra’s tapestries and textiles when I first spied them years ago in Metropolis mag. Her story is equally interesting. She raises her own sheep for the felted wool creations she makes and dyes them with plant based dyes grown on her own farm. How dreamy is that? Her creations are stunning pieces of textile design that are featured in museums and public venues like Lincoln Center. Weaving with natural materials got me thinking about the amazing things that can be created by combining different materials in a more “raw” form. If you’re looking for more weaving projects for kids be sure to check out the Paper Weaving we did last month. Want another unusual use of sticks and string? Pop over to our Recycled Bird Feeder Mobiles. And if you love loom crafts but don’t feel like making your own loom then here are some looms for kids that I’m wishing I had right now…. Don’t miss out on our upcoming projects featuring natural materials all month long! Be sure to subscribe or like us on FB to follow along! Your child’s inner Claudy Jongstra thanks you! If you enjoyed this post SHARE IT! What a great idea! Adding to my “to-make” list! Thanks Maryanne! I love Mama Smiles blog!